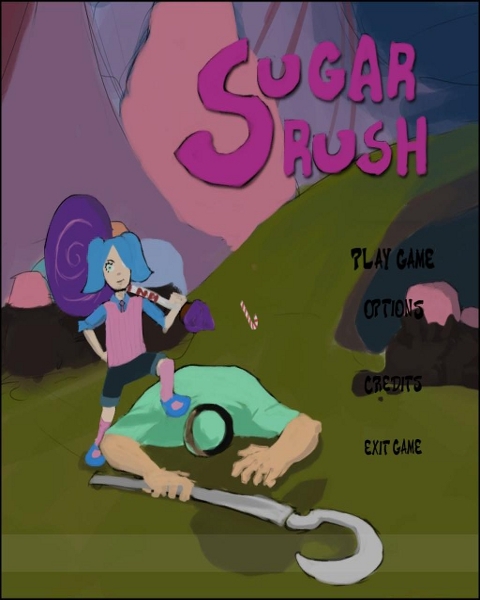 Sugar Rush is a moderately paced third person action adventure game that takes place in Sweetopia. As the hero, the player journeys through the Peppermint Forest, Candy Town, and the Gumdrop Meadows to liberate these areas from the diabolical dentist and their army of vegetables that have taken over. As you vanquish enemies, you reclaim the sugar stolen from the land. As enemies attack you, you lose health, which can be restored by eating part of your weapon. As you eat the weapon, it loses strength which is restored by collecting dropped sugar from defeated enemies. Collecting a large amount of sugar activates a sugar rush, which increase speed and power for a short time, but causes a “crash” after which reduces speed for a very short duration. The player will now be able to venture through the entire Level of Sweetopia in Sugar Rush. In the Sweet Forest the player will be introduced to the Range Dentist. The Ranged Dentist will shoot a rapid fire of water from his water pick gun at the player that will do light damage then after a few seconds the Dentist will fire a special shot that is slightly slower and will root the player in place making the player unable to move or attack until broken free after button mashing to get out. The player however can try to reflect the special shot with a light attack sending the past back to the Dentist and rooting him instead. This will allow the player to move in and get a few free hits on the Dentist since if the Dentist is not rooted he will jump away keeping his distance from the player. When the player reached the last combat area in the forest they will be introduced and face off against the Boss Dentist (not his final encounter spot). The Boss Dentist uses a mix of moves similar to the Melee and Range Dentist with s slight twist so players will still be used to his tactics but it will still feel like a new encounter. The Boss Dentist's first stage will be his melee stage in which he will uses his tooth drill and perform swipe attacks at the player when within range. Then after a few seconds he will go for an overhead attack that like the melee will get stuck rooting himself in the ground for a few seconds allowing the player to attack him. Next stage the Boss will go into his range state in which he will though packets of tooth paste in the air lobbing them like grenades. It is up to the player to dodge these attacks by observing the the shadow spots on the ground indicating where they will land. In the final stage the Boss will shoot his drill bit underground and make it burrow towards the player hitting them from underneath. The player will be able to dodge the attack by observing the drill tunnel path on the ground and jumping out of the way before it pops out of the ground. I was one of the presenters that presented with you guys on Saturday, I want to say that your presentation was impecable, and in that you should all take pride. Not only that, your game looks like it has a lot of potential. Keep up the good work. You will go far. Thank you, we enjoyed your presentation as well. We are very proud of our game and appreciate your words of encouragement, we know you will go far too.